Blackbrush is a member of the rose family. It appears as a low bush with gray green leaves which grow in clusters all along the branches. It has dark gray bark which becomes black with age or when wet (giving the plant its name). It grows in dry gravel or sandy open plans at altitudes between 3000 - 6500 feet. It is browsed by sheep, goats and deer. 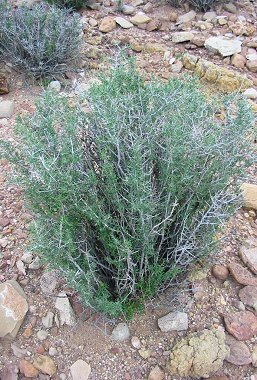 Blackbrush is the characteristic plant of the Tonto Plateau in the Grand Canyon.